Cradle Will Rock is a 1999 drama film written, directed, and produced by Tim Robbins. The film fictionalizes the true events that surrounded the production of the 1937 musical The Cradle Will Rock by Marc Blitzstein; it adapts history to create a fictionalized account of the original production, bringing in other stories of the time to produce this commentary on the role of art and power in the 1930s, particularly amidst the struggles of the 1930s labor movement and the corresponding appeal of socialism and communism among many intellectuals and working-class people of that time. The film is not based on Orson Welles's script The Cradle Will Rock, which was to be an autobiographical account of the play's production. It went into pre-production in 1983 with Rupert Everett on board to play Welles before the backers pulled out and the production collapsed. The film continues, providing a picture of life in the 1930s, a time when some people wait in endless unemployment lines attempting to get work while others enjoy their wealth, attending parties and purchasing expensive works of art. As the musical nears production, the Orson Welles (Angus Macfadyen), and producer, John Houseman (Cary Elwes), lead the cast to another theater that was secured at the last minute. The cast is forbidden to perform by their union, so Blitzstein takes the stage alone at an upright piano to perform the show himself. He is shortly joined by many of the other cast members, delivering their lines from the audience. Robbins juxtaposes this final triumphant moment of the theater with images of the destruction of the mural Man at the Crossroads commissioned by Nelson Rockefeller (John Cusack) because the artist, Diego Rivera (Ruben Blades), refused to remove the image of Lenin's face from the piece. In tying together stories of labor issues and steel strikes, censorship in painting and theater, and the disparities of wealth and power, Robbins is able to paint a picture of the 1930s that goes beyond simply recounting past events and questions the boundaries between art, power and politics. Furthermore, Robbins attempts to link these issues to the present day through the final shot of the film. The camera follows a mock funeral procession for the FTP as it marches into Times Square, only to pan up from this scene to a shot of the high rises and neon billboards that stand there today. This film takes place in the 1930s during the Great Depression. The film takes some narrative license and presents certain events as simultaneous, when they really occurred at different times. Some examples of this are the addition and subsequent destruction of Rivera's Man at the Crossroads in the RCA Building (1933–34), the Italian invasion of Ethiopia (1935), labor strikes against Little Steel (1937) and the Dies Committee’s assault on the Federal Theatre Project (1938) (Weales 2000). In telling the story of The Cradle Will Rock—a leftist labor musical that was sponsored by the Federal Theatre Project (FTP) only to be banned after the WPA cut the project and diverted its funds elsewhere—Robbins is able to tie in issues such as labor unrest, repression by the House Committee on Un-American Activities, and the role and value of art in such a tumultuous time. The film was released in conjunction with a book that Robbins put together to provide a deeper look into the film's time period. The book includes the film’s script, which is accompanied by essays and pictures describing the people, events, and themes that are the basis for the film. The children's play Revolt of the Beavers by playwright/screenwriter Oscar Saul (who would later do the screenplay for A Streetcar Named Desire) was also featured in this film. It, too, was under scrutiny from the HUAC for promoting a communistic ideal of equal work and equal rewards. In the film it was valiantly defended by the head of the FTP, Hallie Flanagan (Cherry Jones), and the play ran for approximately one month at the Adelphi theater in New York. 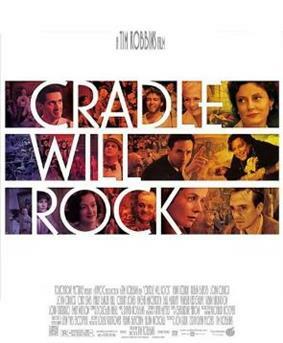 While the original production of The Cradle Will Rock was stated to be "The most exciting evening of theater this New York generation has seen" (MacLeish, Cole 2000), some critics did not feel the same about Robbins' reproduction of the event for film. Although it was nominated for the Palme d'Or at the 1999 Cannes Film Festival, among other festivals, and some have praised the film as an astute commentary on censorship and the lines between art and life (Cole 2000), others have criticized the piece for attempting to bring too many themes together into one story, and thus losing the power of the original context altogether (Alleva 2000; Weales 2000). The film has a rating of 64% on Rotten Tomatoes. ^ a b "Cradle Will Rock (1999)". Box Office Mojo. Retrieved 2011-08-15. ^ McBride, Joseph (2006). What Ever Happened to Orson Welles? : A Portrait of an Independent Career. University Press of Kentucky. p. 223. ^ "Festival de Cannes: Cradle Will Rock". festival-cannes.com. Retrieved 2009-10-04.